Season the chicken strips with salt and pepper. Make a breading station. In the first bowl put some flour. In the second bowl, whisk eggs. In a third bowl, mix together panko, coconut, and ginger. Dredge the chicken strips lightly first in the flour mixture and then into the eggs, and then the bread crumb mixture. Place on the prepared baking sheet. Bake at 375 F for 10 to 12 minutes till cooked through. Alternately fry these strips till crisp and golden brown on the outside and fully cooked on the inside. Serve as is with a dipping sauce or on salad greens with a vinaigrette. 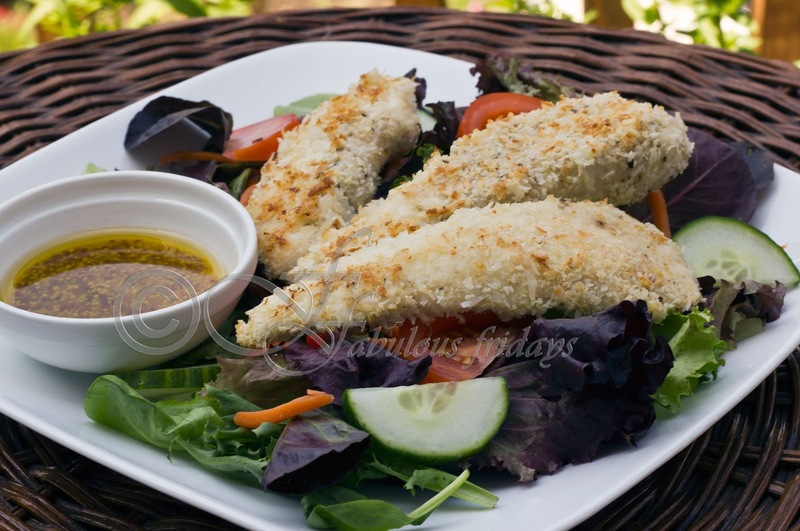 Serve the chicken strips over salad greens, sliced cucumber, tomato, radish and grated carrots drizzled with some vinaigrette. 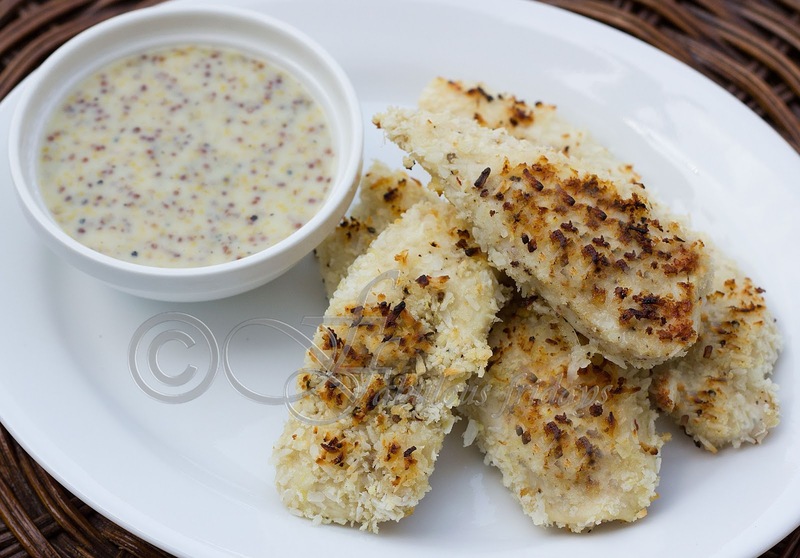 Typically made with mayonnaise, this delish dipping sauce is a must with any chicken nuggets. Substitute mayonnaise with hung yogurt and you will not miss anything except the calories. Whisk all ingredients together in a bowl and serve. Place a sieve lined with cheese cloth over a bowl. Put 1 cup yogurt on the cheese cloth, cover and place in the refrigerator overnight. All the water from the yogurt will filter out into the bowl leaving a thick creamy hung yogurt perfect for marination. Use this for marination or as a substitute for cream in any recipe. A great healthy option.